Now that you have made a model watershed, you'll check out real watersheds across the contiguous USA and explore the one in which you live. 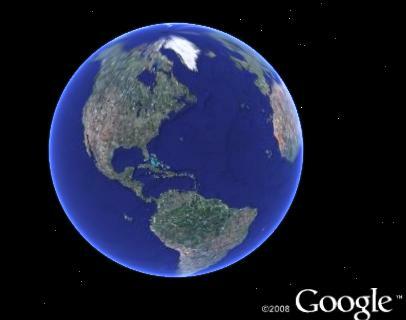 Google Earth is a freely available virtual globe program. It displays satellite images, aerial photographs, and graphic layers on personal computers by serving them over the Internet. Advanced versions of Google Earth are available for purchase, but this activity uses the free version. If your computer doesn't have Google Earth installed, download and install the free program. 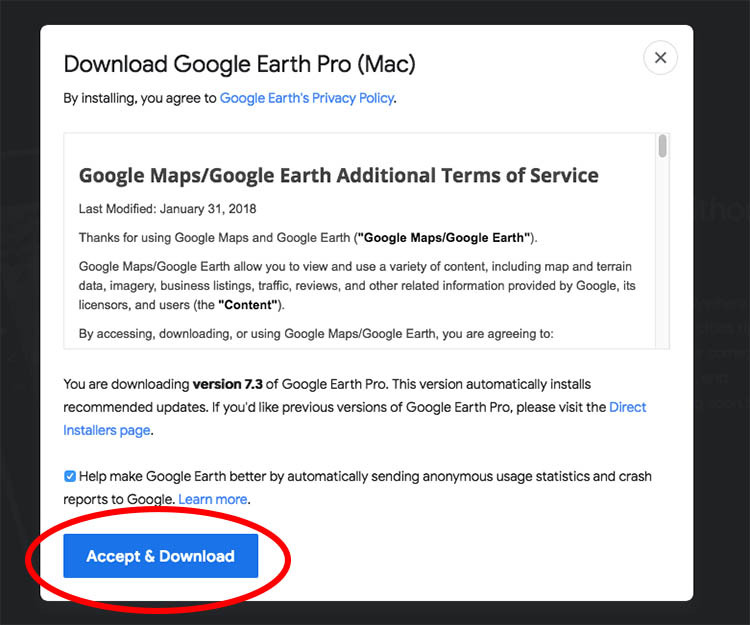 Access the Google Earth download page then download and install the free version of Google Earth for your operating system. Click this Google Earth download page link to open the download page in a new window. On the download page, click "Agree and Download" and the software will be transferred to your computer. Click "Run" twice, if you see more dialog boxes. Launch Google Earth by double-clicking its icon or choosing it from the Programs list under the Start menu. In Google Earth's menu panel on the left, under the Layers list, check the box in front of Borders and Labels to turn this layer on. Minimize your Google Earth program and return to your Internet browser to access watershed data. 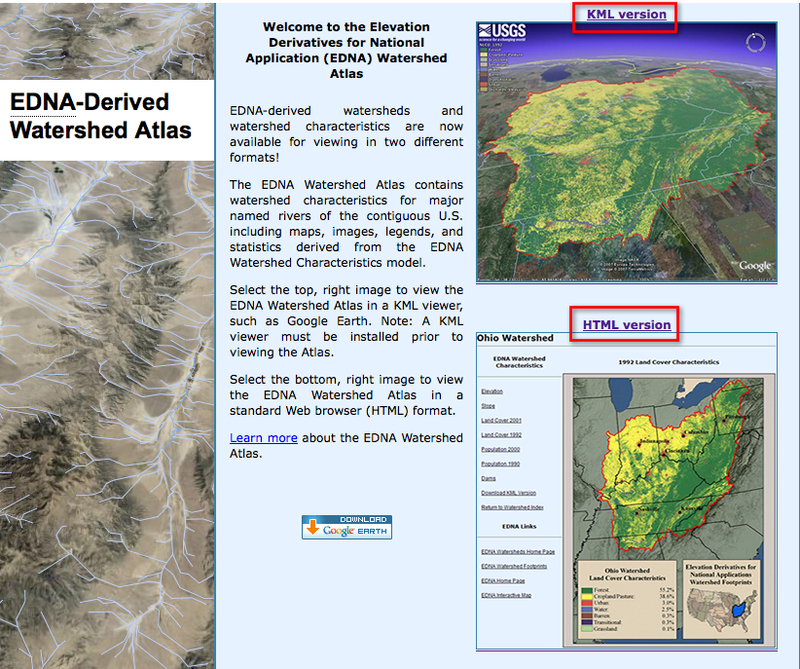 Go to the EDNA-Derived Watershed Atlas Home Page. EDNA Homepage There you will see two choices: one for HTML and one for KML. Start with the HTML site. On the interactive EDNA HTML map page, place your cursor (but don't click) over the names in the text list of watersheds to highlight them on the map. Be sure to take a look at the extent and location of the Colorado, Missouri, Ohio, and Mississippi watersheds. Place your cursor over the name of a watershed. It will highlight in blue on the map. How is it that the Mississippi watershed encompasses several other smaller watersheds? Rivers of the smaller watersheds all empty into the Mississippi River. Every place within the Mississippi watershed eventually flows down the Mississippi River. Major tributary rivers that flow into the Mississippi are considered as separate watersheds within the Mississippi system. On the interactive watersheds page, click the link above the map to switch to the KML page to download and view a Google Earth file of the US Watersheds. EDNA US Watersheds KML page. 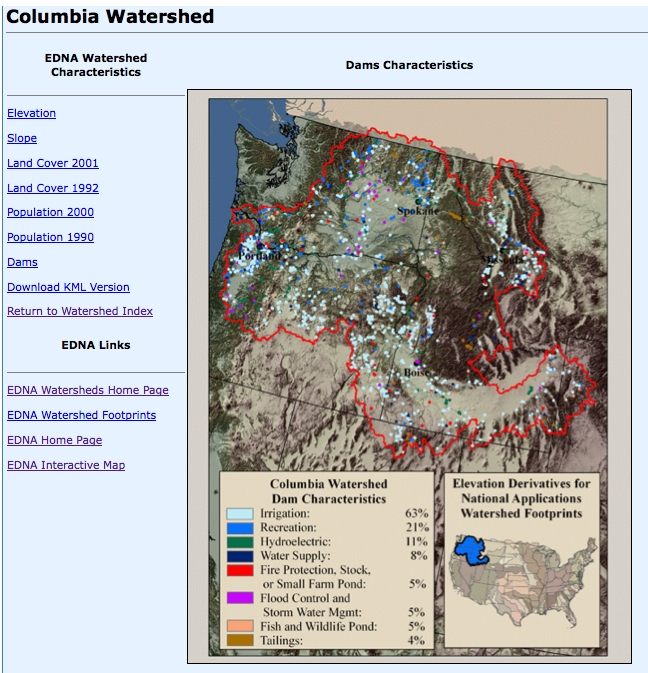 On this page, you can download individual watershed maps or a map of the entire United States. Click anywhere on the map graphic to download the .kml file that outlines watersheds of the contiguous United States. Note that .kml stands for Keyhole Markup Languagethis is one of the file extensions for Google Earth files. This large file may take a few minutes to download; save it in a place where you can find it again. Right-click to download this KML file of watersheds USwatersheds.kml (KMLFile 1.5MB Oct25 11) instead of using the link above. Re-launch to Google Earth. If necessary, open USWatersheds.kml by choosing File > Open and browsing to the location where you saved the file. To make returning to this file easier, you can save it to your "My Places" folder. Google Earth displaying the landcover layer for the Trinity Watershed in Texas. In the Search field at the upper left, enter your city and state name then click the magnifying glass. Google Earth will fly to your city and zoom in. Zoom out from your city until you see your entire watershed outlined in red. Click the green circle with blue lines that shows next to the name of your watershed. Right along the coastline, water flows directly downhill into the ocean along small streams, so these areas are not considered as parts of inland watersheds. The topography of some regions funnels all the precipitation to a point within the watershed. In these basins, water gathers in a land-locked lake rather than flowing to the ocean. If the map does not show a watershed label for your area, select one that is nearby for your investigation. In the case of a landlocked watershed, select the larger watershed that contains the on in which you live. Inside the dialog box that opens, click the "View the _____ watershed" link. This action directs your computer to download additional information for your watershed. Be patient: it usually takes a minute or more to download these data, and there is no evidence of anything happening while you wait. When you see an overlay on the map showing a landcover image over your watershed, the data layers have been downloaded. 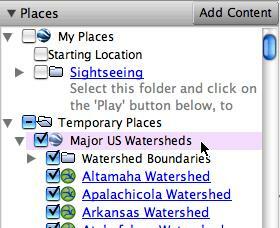 Scroll to the bottom of your Layers list in Google Earth to find a new folder with your watershed's name. Several sample images from the EDNA server can be viewed using the images linked in the hidden below. Click on the images linked below to learn more about these watersheds. These are a few of the images that are linked to the Google Earth file. Click the thumbnails for a larger view. In Google Earth, in the Layers panel, click the small triangular arrow that points to the Watershed Layers folder; this will expand the folder so you can see all the data layers available to you. The "Watersheds Characteristics" layer shows a button on the map that gives you access to Web pages about the watershed. Deselect this layer during your Google Earth exploration. 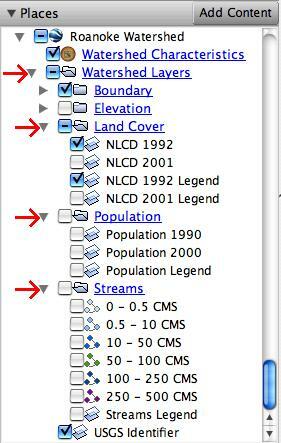 Expand the sub-folders for Landcover, Population, and Streams and turn separate layers on and off. Use the legends to interpret the colors on the map. Examine the relationships among the layers. Click the name of a layer in the Layers list and use the transparency slider just below the list to see through your highlighted layer. After some exploration, turn on your Elevation layer and make sure it is not transparent. Turn landcover and population images off. In the stream layer, turn on the largest streamsthe ones that have the highest values for CMS (cubic meters per second). Sequentially add the smaller streams by clicking the boxes for streams of decreasing size. Note the patterns that develop as you add the smaller streams that are tributaries to the larger rivers. Turn the smaller stream layers on and off to help you visualize the location of drainage divides within your watershed. Compare a zoomed in view of the smallest streams to what you saw in your physical watershed model. Return to the interactive EDNA HTML page, click on a watershed of interest, and go to that watershed's page of informational links. Click the Dams link to see the types and locations of dams that have been built to keep water from running downhill. In the screen shot, below, the Dams link has been selected. The image is showing Dams Characteristics. Go back to your Google Earth map and turn off all Elevation, Landcover, and Population images. Leave all stream layers on. Zoom in to one of the larger streams to check out one or more of the dam sites shown in the online graphic. Turn on the Terrain layer at the bottom of the Layers list and use Google Earth's tilt and zoom features for further exploration. Choose another watershed in a different part of the contiguous United States. Access the data layers for it and explore them to compare that watershed to your own. 3. Starting at the largest river in your watershed, use the tilt and zoom features of Google Earth to "fly" upstream along smaller and smaller tributaries. What differences do you see in the landscape, landcover, and population densities near the areas' largest streams compared to its smallest tributaries? 4. Write a description of your watershed. Include information about the shape of the land and how the land is used. What purposes do the dams in your watershed serve? Indicate how the population density of the area changed from 1990 to 2000. Use screen shots of different views in your Google Earth map to support or illustrate your description. On a Windows computer, press Alt and Printscreen at the same time; this will save an image of the screen in the computer's clipboard. Place the image in a word processing document by choosing Edit > Paste. On a Macintosh, press shift-command-4 (command key=apple key) and drag a box over the area of the map you want to capture. This will produce a file named Picture1.png on your desktop. Use Insert > Picture > From File to place the image into your word processing document. 5. In places where rivers are designated as a political boundary between two adjacent states or countries, the two entities may have disputes about the river. For instance, they might argue about which one has the right to use the water or set rules about what waste products can be discharged into the river. Briefly discuss some advantages and disadvantages of using drainage divides rather than rivers as political boundaries.